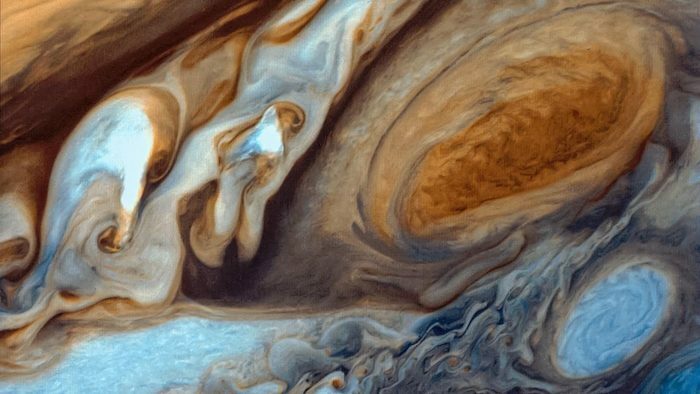 A persistent whirling feature in Jupiter’s atmosphere large enough to swallow Earth, aptly dubbed the Great Red Spot (upper right, above), may get some of its namesake color from sulfur compounds generated when cosmic rays and ultraviolet light zap a common substance in the planet’s clouds, new research suggests. That little-studied compound, ammonium hydrosulfide (NH4SH), is typically a clear and colorless solid, and at the conditions prevalent high in the jovian atmosphere it would either form the core of ice grains or a frosty coating on other particles. New lab tests show that when NH4SH is bombarded with high-energy cosmic rays—in this study, protons accelerated to about 14,000 kilometers per second—it breaks down into several varieties of chemical shrapnel, including negatively charged ions of S3 and S6. UV light irradiating the substance probably generates the same breakdown products, the researchers suggest. A detailed analysis of the lab-zapped substance reveals that the mixture strongly absorbs blue, violet, and near-UV wavelengths of light (300 to 500 nanometers), leaving relatively higher proportions of wavelengths from the center and red end of the visible spectrum in the light that’s reflected, the researchers report online and in a forthcoming Icarus. Because the absorption spectrum measured in the lab doesn’t exactly match that observed by the Hubble Space Telescope and other instruments, the light-absorbing characteristics of other atmospheric constituents such as methane may help contribute to the perceived color of the Great Red Spot. Future tests that also include other common jovian gases may help better recreate the distribution of wavelengths astronomers actually observe, the researchers say.